Sushi is my favorite food in the whole world is always my first pick for: if you were forced to eat one meal for the rest of your life, what would it be? It's such a conveniently wrapped package of fresh fish, fresh vegetables, sweet rice, and nori. We don't go out for sushi very often because it can wrack up quite a charge (we have a hard time limiting ourselves when ordering) and a recent foray into saké has made matters worse in the budget department. 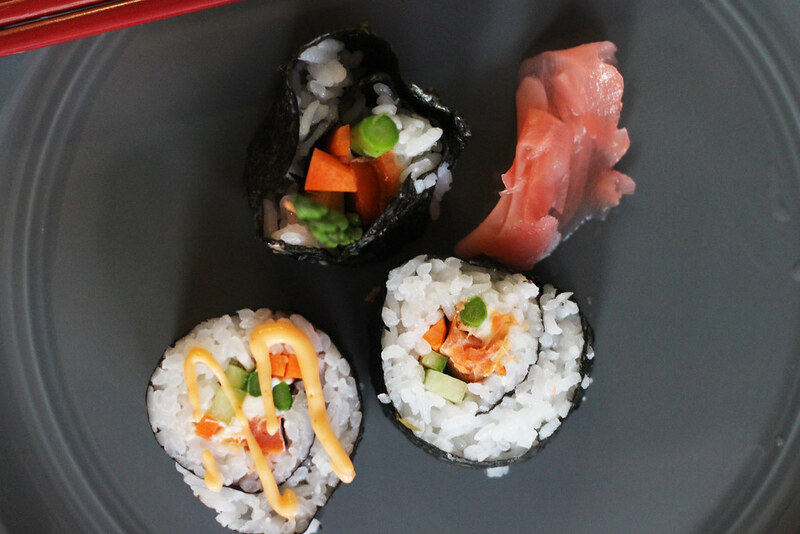 Sushi happens to be extremely easy to make at home and as long as you have access to a cheap bamboo mat (or similar, pliable something to roll your sushi with) and some great fish, you can make sushi to your heart's content. 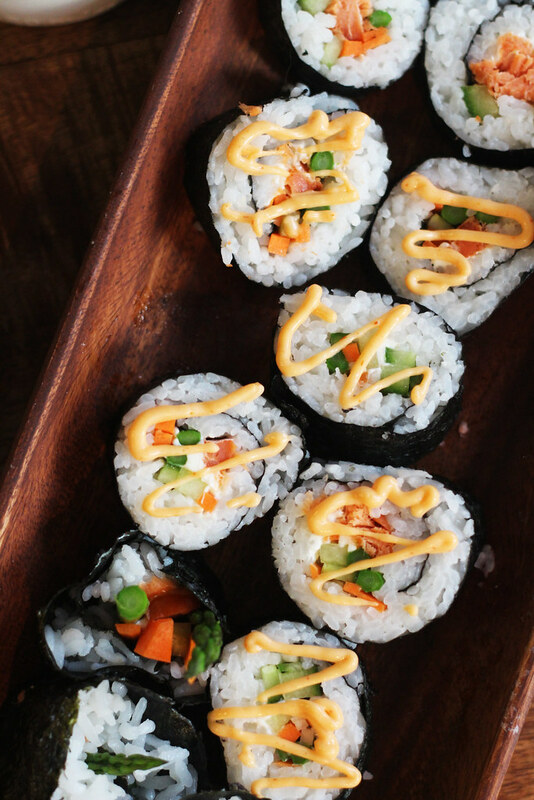 All told, this recipe probably took us about an hour as there's a bit of prep work (chopping vegetables, making sushi rice) but creating the rolls can be a great group or couple activity. Sushi making is also great for entertaining and involving guests in the prep work! 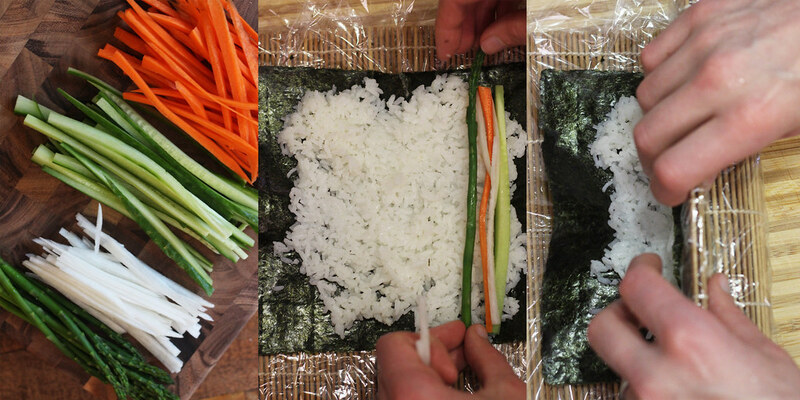 Wrap a bamboo sushi mat in Saran wrap to keep it clean and un-sticky. Rinse three cups of white rice three times. Add three cups of water to the pot and cover on high heat. Once the rice boils, turn the heat to simmer and cook for 20 minutes. Mix four teaspoons of rice vinegar and four teaspoons of white sugar in a small bowl and microwave for thirty seconds. Add mixture to your rice when it has cooled slightly on the stove, mixing gently so as not to mush the rice. On the bamboo mat, lay out a piece of nori and cover with a thin layer of sushi rice, leaving a 1/2-1" border around the edges. 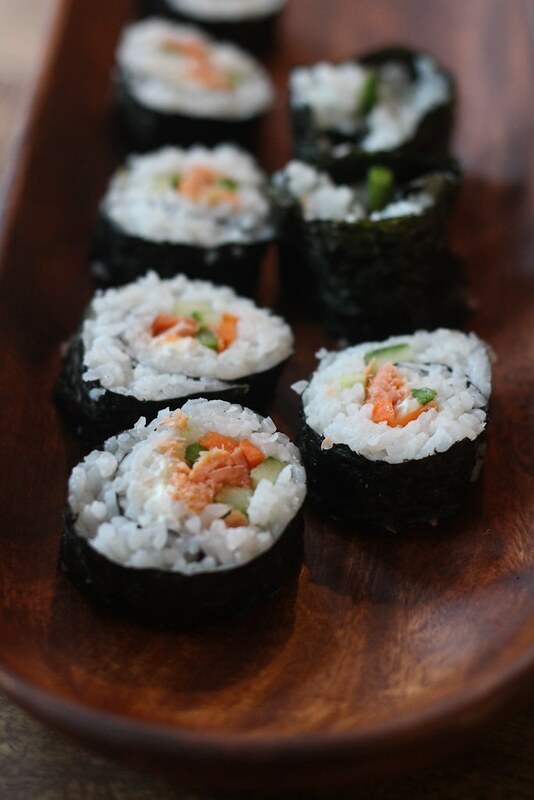 Lay your vegetables along the mat in a pile (they should be parallel to the direction you're going to roll your sushi), add salmon, and cream cheese taking care not to stuff your rolls too much. 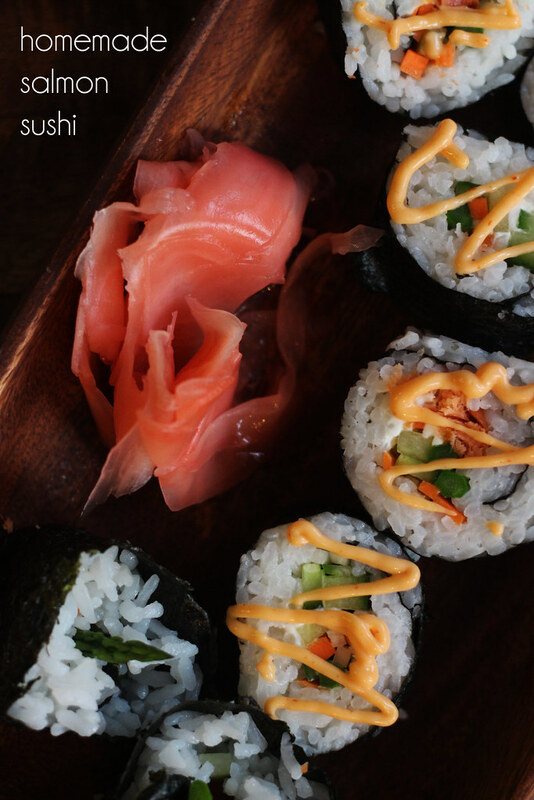 Begin to roll your sushi tightly, taking care to pack in the contents tightly. Once rolled, remove your sushi from the mat and slice it into 1/2-3/4" slices with a wet knife (keeps the rice from sticking). 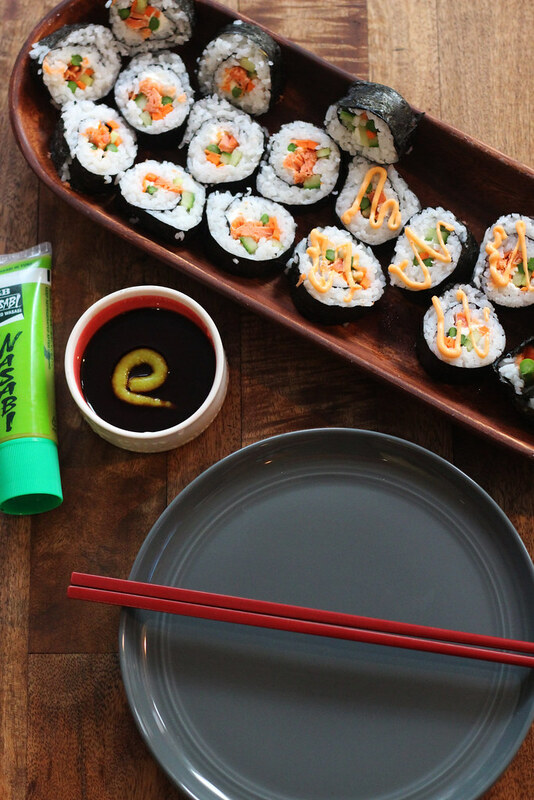 For toppings, we usually like to enjoy wasabi mixed with soy sauce in a dipping bowl and sriracha mayo. To make the sriracha mayo, add a few teaspoons of olive oil mayonnaise and a squirt of sriracha to a ziploc bag and mix well. Cut the tip off the bottom of the bag and decorate your sushi with the sauce. This looks delicious, you did a great job. Yum. Do you ever make sushi with raw fish at home and if so where do you get your fish? We have! We've gotten sushi/sashimi grade fish from Uwajimaya in Beaverton before! Okay, cool. I want to try it! omg this looks soo good! thanks for share it! Great photos and instructions. I'm can't eat rice right now, but I will keep this in mind for the future. I love salmon. Yum! Craving sushi now. I'll have to try this out!